More like "everything but the kitchen sink" seasoning. I’ve never tasted Old Bay Seasoning, so I don’t know how close this comes, but I thought it tasted pretty awesome in Jen’s Grandma’s Best Crab Cakes. 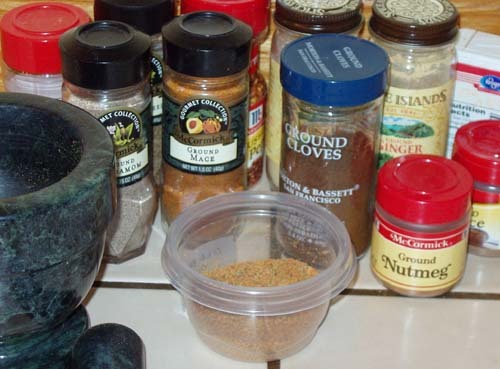 You need a spice grinder or mortar & pestle. Most people use Old Bay Seasoning for seafood, but I hear tell of folks who put it on everything like a season-all or season salt. I had to grind them all together in my mortar. 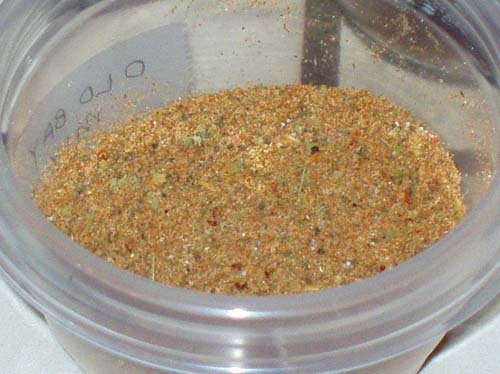 I suspect I could have gotten away with ground bay leaves if I had them and ground celery seed or maybe even celery salt (to replace seeds & salt), but I think grinding up the red pepper flakes is important, too.